This post is about skin the 22 yards of it that the average sized body has. I think we tend to hear the "beauty starts on the inside" saying and think it's about personality rather than what we put into our bodies, I for one know that if I eat c**p I feel and look c**p, you know the feeling when you are off your game, and maybe have too many take- aways or holiday over indulging or even the season we are just entering, all scary times in terms of the drastic effects that can actually be seen on your skin. Although I do try and keep to healthy eating I am no saint, and have a tendency to rely on creams etc to fix the damage a bad diet and lack of sleep do to my poor face. I have been lucky enough to have tried and tested Collagen Shots from a company by the name of Rejuvenated, if you haven't heard of them check out their website Rejuvenated there is also a brilliant YouTube video on there. 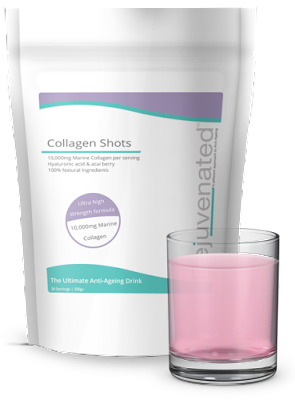 I must admit I had never really given this kind thing a thought, and was really keen to give my body some *Internal Love* so I started on my month of nightly Collagen Shots........no I didn't start injecting myself in the rump, it's not that kind of "shot"
One scoop from the scoop provided. The taste isn't a Mc Donalds milkshake but it really isn't unpleasant, a little bit like diluted berry flavoured fruit juice. I must admit at first I thought ........ "this is ok, but cant really see it that it's going to do anything" WRONG.......I can visibly see and feel the difference in my face, the skin feels firmer to the touch and kind of bouncier, sounds mad, but that's the best way to describe it, it definitely looks brighter, and dare I be so bold as to say a little bit more youthful.......ok I don't mean I suddenly look 20, but it definitely has a bit of a glow going on. It turns from cloudy to clear. ready to drink. The biggest thing for me apart from my face, are my arms........you can get up now and stop laughing, but those of you who are of a certain age will know what I mean about the "arm" thing ! the inner tops of my arms are definitely firmer, I do have a thing about this area, I think it is extremely unfair that it should show signs of age.......cruel cruel world, but Collagen shots have 100% helped to improve this skin, I can say this with confidence as it can't be anything else ! Take a peek at the Rejuvenated Website you will be pleasantly surprised.